View cart “Lady Marina” has been added to your cart. 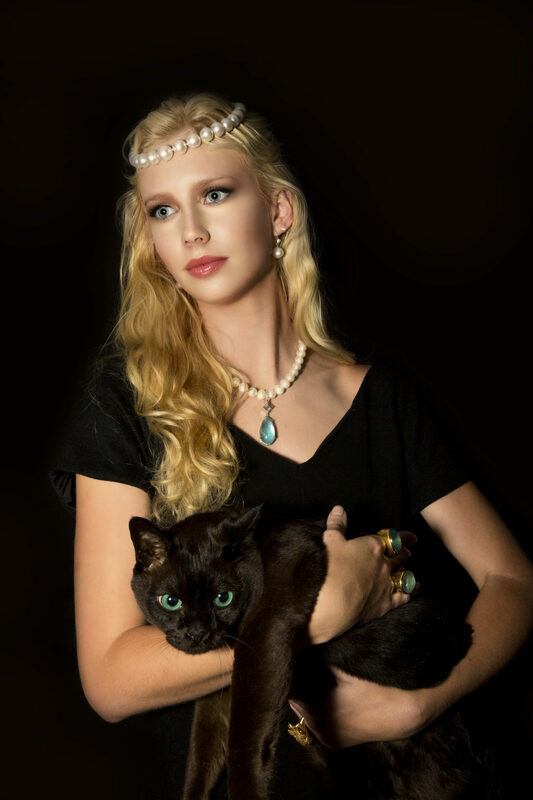 This single strand necklace is comprised of 38 hand-knotted, graduated freshwater pearls of good lustre. 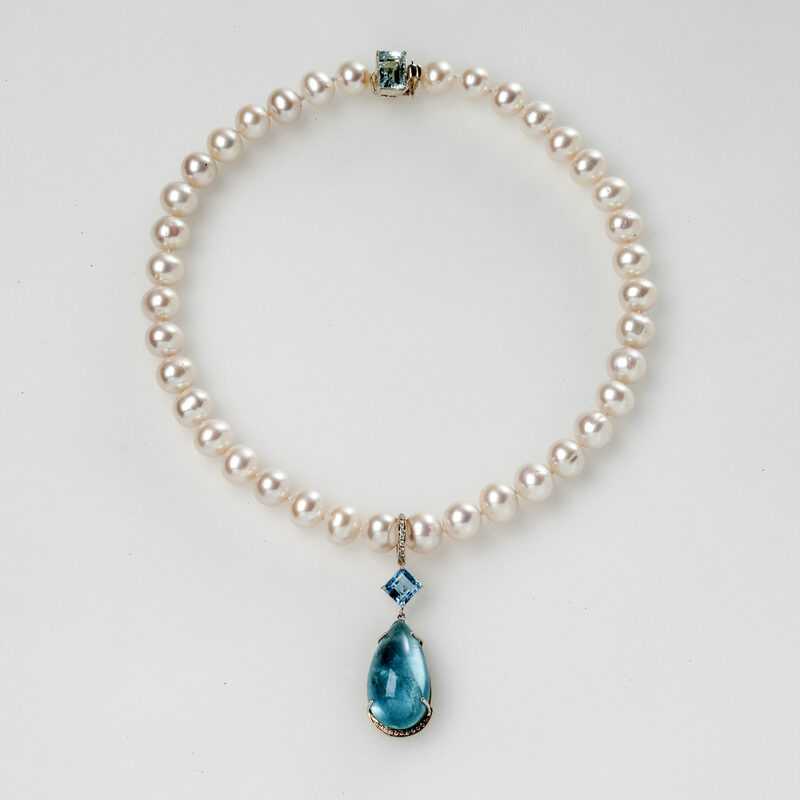 From the centre of the pearls hangs a pear shaped pendant of a luminous aquamarine cabochon, suspended from a mid-blue aquamarine, set with 21 brilliant cut small diamonds on mother of pearl backing. The mother of pearl backing is there to inhibit the owner’s flesh colour penetrating the lovely stone, preserving the blue to its maximum. The necklace is completed with a clean, pale blue faceted emerald cut (rectangular) aquamarine which is set into the clasp. The necklace is made in rhodium-plated sterling silver. It could be re-made in white or yellow gold (by order only). If Lady Marina’s direct ancestors were born in Russia, how is it that she is based in Italy? Early in 1917 Lady Marina’s family went on vacation to their seaside villa in Italy. They were still there (on their usual extended holiday) in Portofino overlooking the Mediterranean in 1918, when the Russian revolution erupted – and (having titles) it was decided not to return. All their former properties in Russia were no longer theirs. Their previous life had gone. They were lucky to be alive. When Lady Marina was born her family named her Marina both for her blue, blue eyes and in reference to the azure blue of the Mediterranean Sea on a calm, sunny day in their new home. This was an acknowledgment that they were now officially Italian citizens. As her blue eyes were so potent the family gave her a gift of Brazilian Santa Maria aquamarine and diamond earrings and a large ring to match. The name ‘Marina’ comes from the feminine of Latin Marinus meaning ‘of the sea’. Her long, very blond, slightly wavy hair gives her the arresting appearance of a semi-divine being – something between a princess and a mermaid. Apart from their Italian properties, she (and her family) lost their inheritance but she now supports herself by taking people on diving trips around the world. She has had to quickly learn to be successful in business, however she is now a great success. 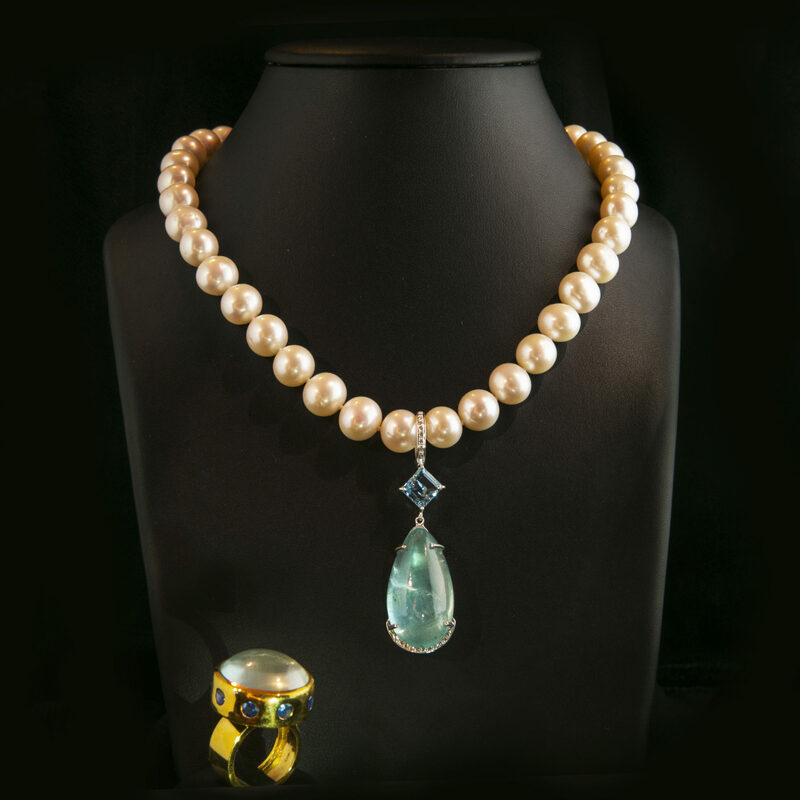 To match her earrings and rings (a family gift at birth), Lady Marina bought herself the pearl, Brazilian Santa Maria aquamarine and diamond necklace, now called ‘Lady Marina’. 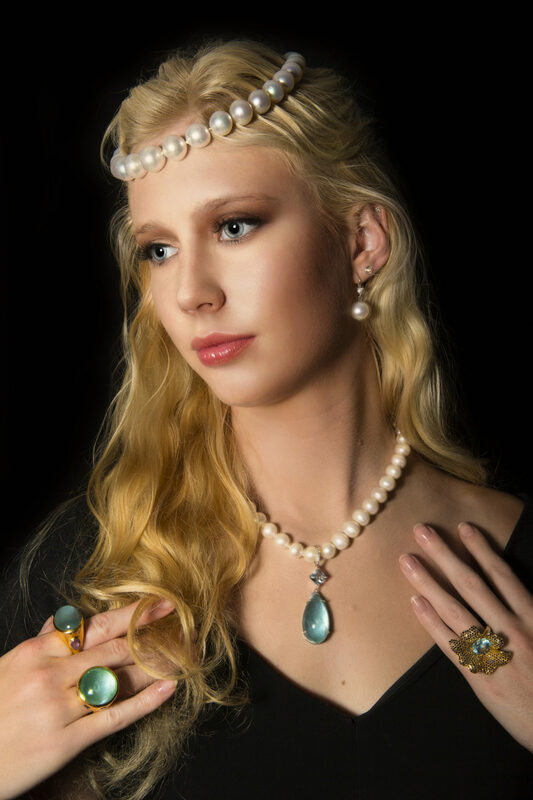 In her mind the pearls – and a gem named after water (aquamarine) are most suitable to add to a diver’s jewellery collection. She now owns a fleet of boats of various kinds, taking elegant people most often to Italian diving sites. A unique story inspired a unique piece. The conclusion to the story will be delivered with the piece.